The MagTek BulleT is a high-end mobile card reader, and although it is one of the more expensive mobile card readers, it comes equipped with a number of security protocols that help keep customer data protected. Encrypts card data after the card has been swiped, has card authentication to immediately detect counterfeit cards. Uses triple DES encryption and 2-factor authentication. The BulleT has an easy-read status LED, and the Bluetooth interface allows for card reading up to 30 feet away from the mobile device. 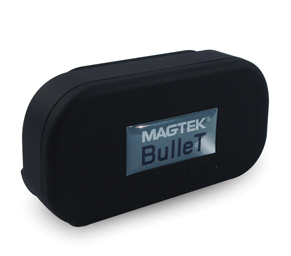 The MagTek BulleT is a Secure Card Reader Authenticator with Bluetooth wireless interface that communicates with nearly any point-of-sale set up (PC, tablet, or smartphone). The BulleT has reached end of life. We recommend the iDynamo as a suitable replacement. • Dimensions (W x D x H): 3.49" x 0.9" x 1.17"